The Qualcomm Tricorder X Prize competition has announced a winner to receive funding for a medical device inspired by the "Star Trek" tricorder, pictured here. Since the 1960s, fans of "Star Trek" have watched generations of futuristic doctors diagnosing and curing crewmembers on remote planets. While our interstellar dreams are still dreams, the tricorder medical device is one step closer to reality. The four-year Qualcomm Tricorder X Prize competition announced a winner yesterday (April 12) and awarded the top prize of $2.6 million to Final Frontier Medical Devices, a Pennsylvania-based team. The competition, run by the X Prize Foundation, challenged teams to create a mobile health-monitoring device like the one featured on "Star Trek." Final Frontier Medical Devices took the top prize — $2.6 million — from the Qualcomm Tricorder X Prize competition for its prototype device, called DxtER. "We think this has been an incredible experience, and we are pushing forward … I would characterize this [tricorder] as a demonstrator kit. The hard work of getting it to the marketplace is really going to begin as this competition closes." A second prize of $1 million was awarded to Dynamical Biomarkers Group, led by Chung-Kang Peng, an associate professor at Harvard Medical School, and supported by HTC Research. "We are in discussions with the Chinese government to start a pilot project," Peng told Space.com prior to the announcement. He said that getting approval from the U.S. Food and Drug Administration will take some time, so the team is looking for another location to set up a pilot project of the entire system to validate their approach. Both Peng and Basil described themselves as lifelong "Star Trek" fans and said that the series is providing further inspiration for them through the various competition rounds. Dynamical Biomarkers Group received the second-place prize of $1 million from the Qualcomm Tricorder X Prize competition for the company's tricorder-inspired medical device. 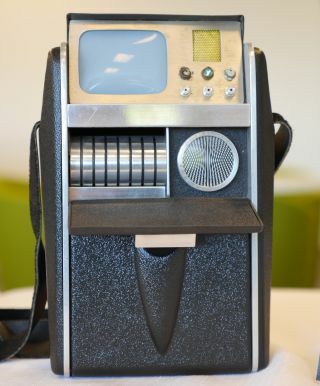 Final Frontier's prototype tricorder is called DxtER (pronounced "Dexter"). The goal of the tricorder team is to produce a device that uses artificial intelligence to learn from clinical emergency medicine, including data from patients seen in the ER. The company's Basil Harris is an emergency room doctor with 15 years' experience, and he was an engineer prior to that. George Harris is a network engineer. Basil said he was glad to "marry" emergency medicine and engineering in the one device, which has noninvasive sensors that collect data about the body's vital signs and chemistry, among other things. "The focus in my group is more in urban areas, where we have major medical centers, and right next door, you have people that can't access the system due to barriers in place," Basil said. He added that there are many possible uses for tricorders in general. While Peng's device is intended for use in remote areas, other applications for tricorders could include helping personnel in refugee camps. All of the tricorders in the competition were supposed to interpret 13 predefined health conditions. There was a required set of 10 conditions to look for, such as pneumonia, sleep apnea or urinary tract conditions. Elective conditions (from which teams chose three) included examples such as HIV, hypertension, cholesterol screening, food-borne illness and strep throat, according to the guidelines on X Prize's website. Teams were also supposed to use the device they created to monitor blood pressure, heart rate, temperature, respiratory rate and oxygen saturation. Although the competition is over, X Prize is planning more testing, research and development for both devices, including support from the FDA, organization representatives said in a statement. Additionally, the foundation will work with retailers for distribution after the device is ready. A donation of $3.8 million by the Qualcomm Foundation to promote "the digital health ecosystem," including testing and development of tricorder devices. Of that money, $2.5 million will go to the University of California, San Diego, including the Altman Clinical and Translational Research Institute. The rest of the money will go to other organizations. A feature-length documentary and museum exhibit to promote public awareness. X Prize is a nonprofit organization that funds public challenges. In space circles, one of its most famous competitions sparked the first pair of private spaceflights, which took place with Scaled Composites' SpaceShipOne in 2003. SpaceShipOne is a predecessor vehicle to Virgin Galactic's SpaceShipTwo, which is intended to take space tourists into suborbital space in the coming years. SpaceShipTwo is currently undergoing flight tests in the atmosphere.